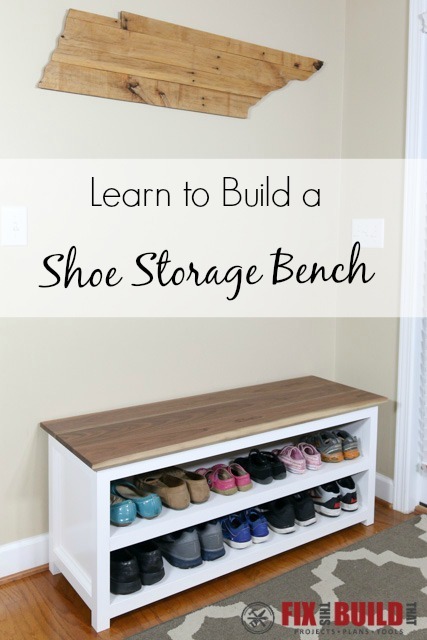 Today I’m going to show you how to build a DIY Entryway Bench with shoe storage. We’re a family of 5 and we’re constantly losing the battle with shoes in our entryway. 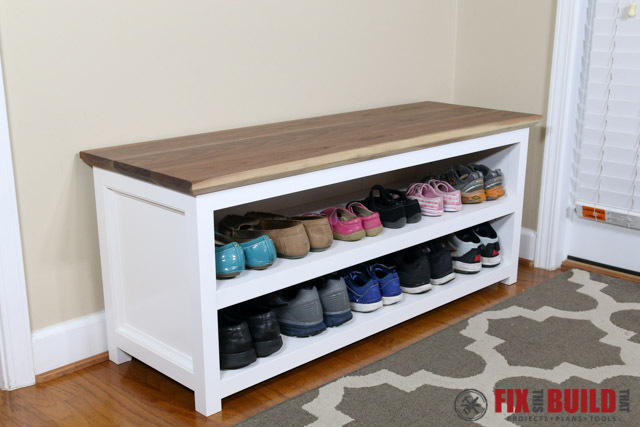 Since our shoes are always a mess we wanted to keep a storage bench there for the kids to sit down on when getting ready. 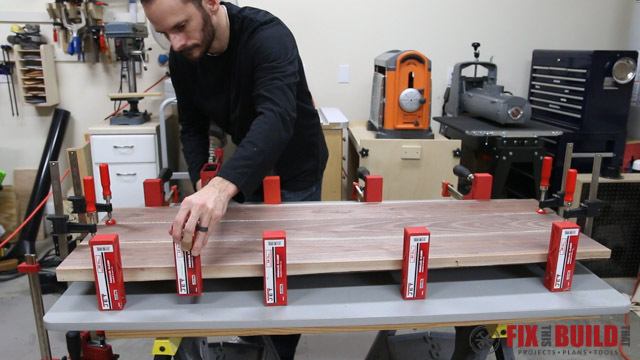 I already made a very similar bench in my DIY Adjustable Shoe Storage Bench post, but I ended up giving that one away. This version has more storage, better aesthetics, is much lighter, and sturdier to boot. 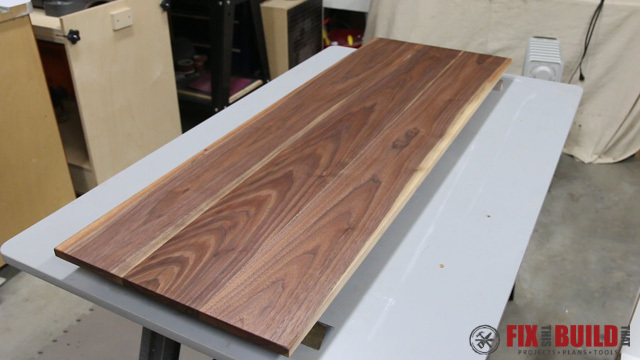 I used some old walnut for the shoe cabinet top, but you can substitute any wood of your choice including stained pine. 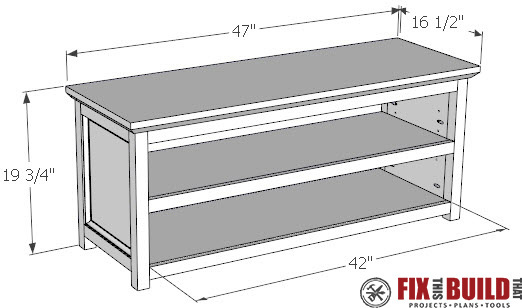 I have detailed plans available to build your own DIY Shoe Storage Bench in my store which include a full cut list, materials needed, and step by step instructions with 3D drawings for each step. 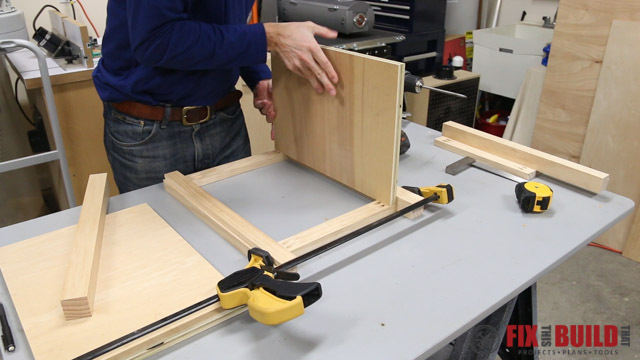 The sides of the entryway shoe rack bench have a modified frame and panel construction. So I started by cutting the legs to length from 2×2 material. 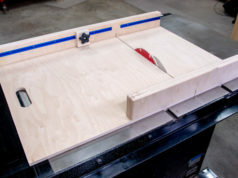 The entryway shoe bench has a 1/4″ plywood back, so I laid out a recess (or rabbet) into the back legs to hold the panel. 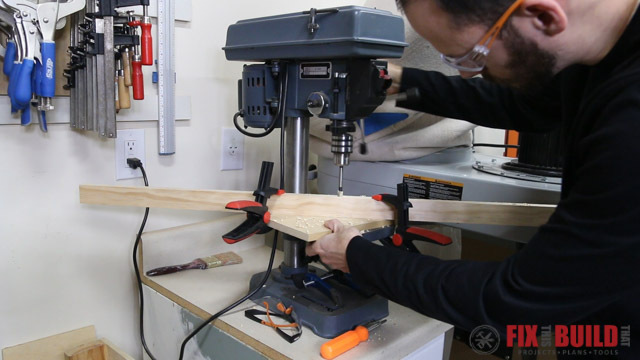 I made one cut to define the depth of the rabbet then raised the blade to match the leftover material. 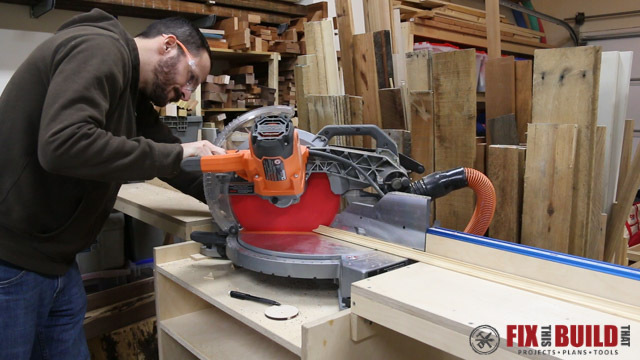 Then I cleared out the material with another cut for a ½” wide ¼” deep rabbet. The legs are joined by a pair of side rails. First I cut 1×4’s to size then ripped them down to get two 1×2 rails from each piece. 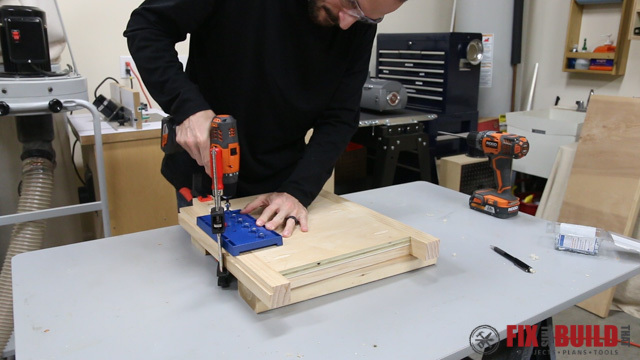 After that I drilled pocket holes in the ends of all the rails with my pocket hole jig. 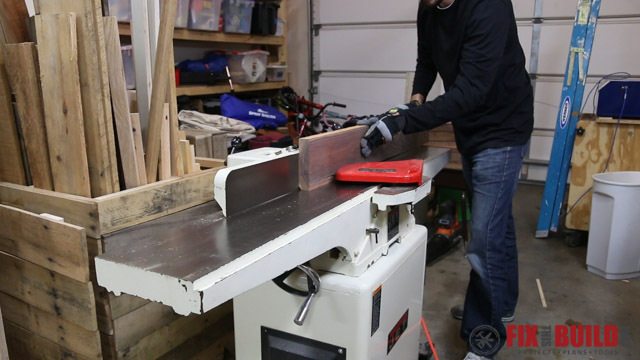 Before joining the rails and the legs together I cut two 3/4″ plywood panels to size then drilled pocket holes in the sides and one on the top. 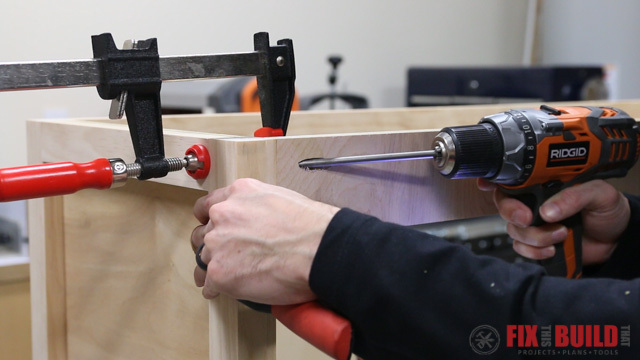 I laid the legs and rails face down and secured the top rail of the shoe cabinet with 1-1/4″ pocket screws. 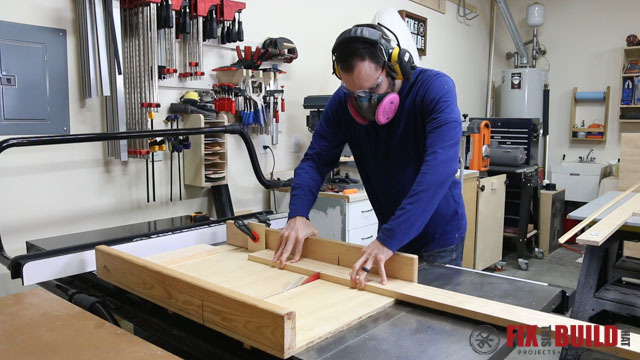 Then I used the panels I just cut to position the lower rails and secured them to the legs. 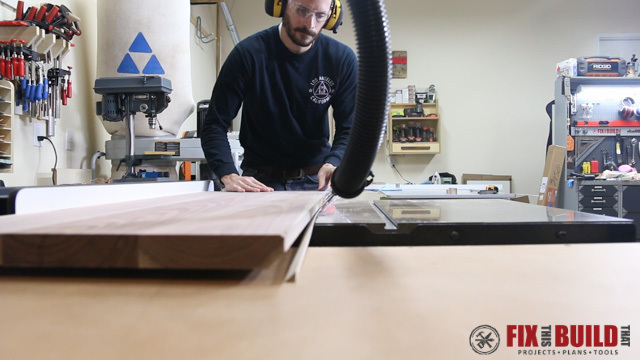 Since 3/4″ plywood isn’t really 3/4 of an inch, I used some playing cards to shim the panels up and make them flush with inside face of the legs. 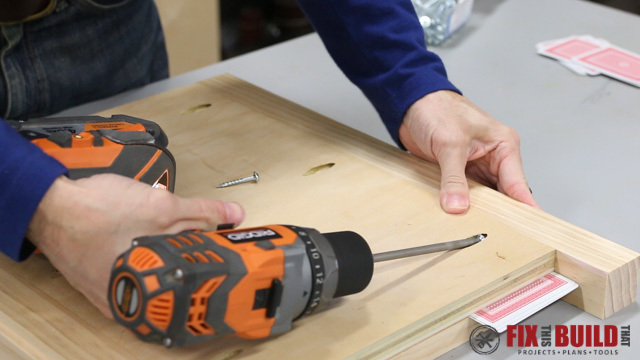 Then I locked everything in place with some more pocket screws. 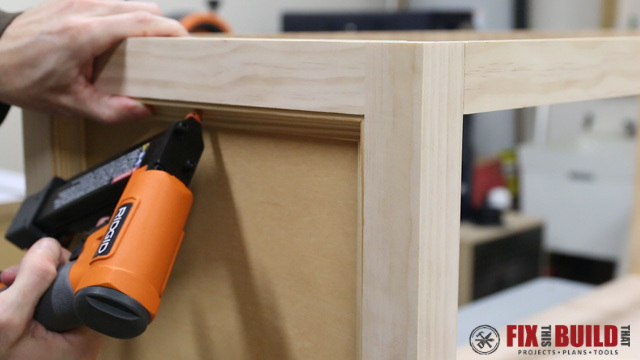 The base of the DIY shoe bench will be painted and for a smooth surface I filled the pocket holes with plugs and sanded smooth. 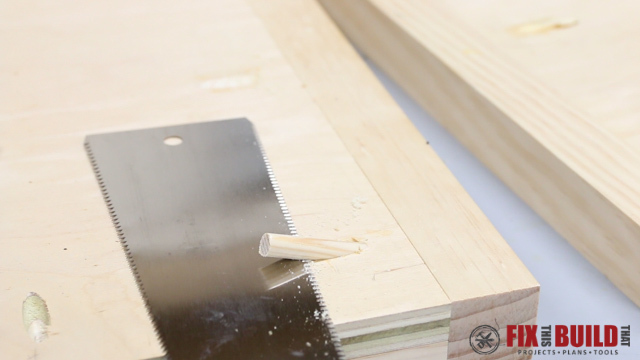 I used ⅜” dowels for the plugs and glue them in them cut them flush with a flush cut saw. 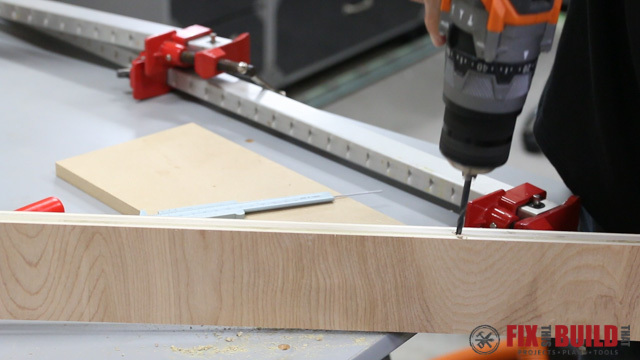 I used a shelf pin jig and drilled the holes on both sides for the adjustable shelf. 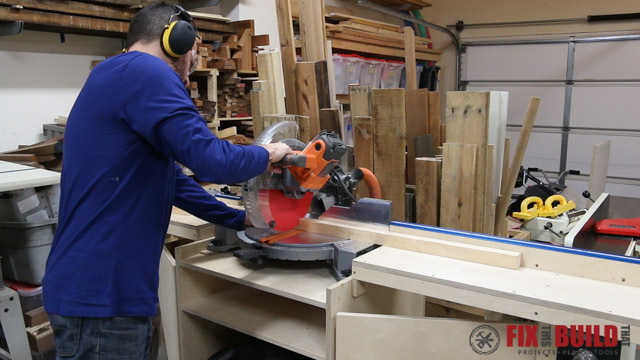 Next I made the lower shelf and the stretchers for the storage bench. 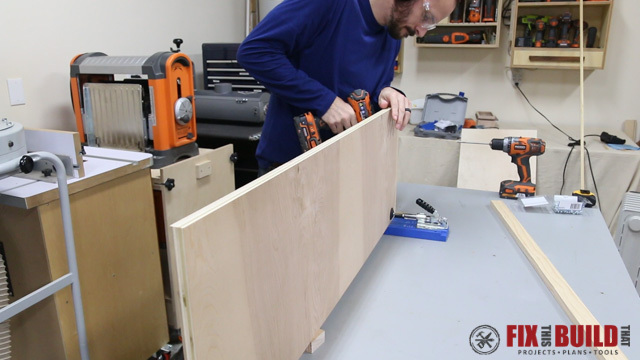 I cut a piece of plywood for the lower shelf and drilled pocket holes along the ends and the front of the shelf. 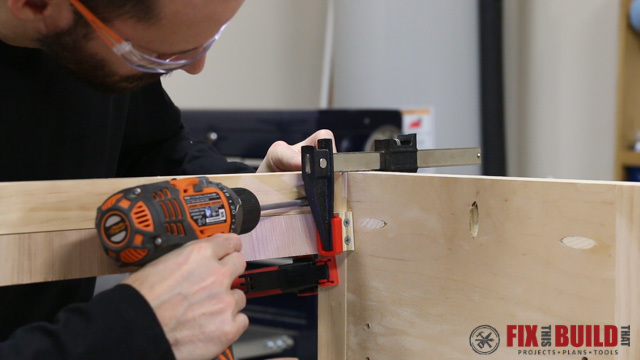 I cut a 1×2 to 42” clamped it to the lower shelf and attached the trim with pocket screws. 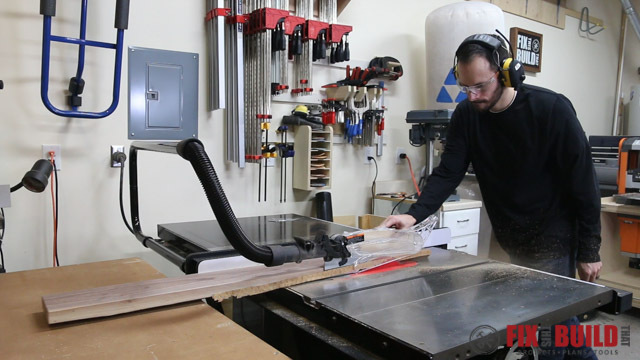 The last piece needed to connect the sides was a back stretcher so I cut it to 3″ for extra support. Also I got it from the left over plywood since it won’t be seen. Then I drilled 3 large counterbore holes with a ⅜” forstner bit in the underside of the front and back stretchers which I’ll use to attach the top later. 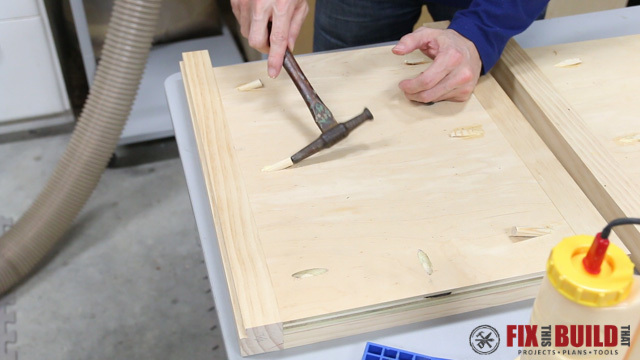 I stopped ¾” from the other side then came back with a 3/16” twist bit and drilled all the way through the stretcher. 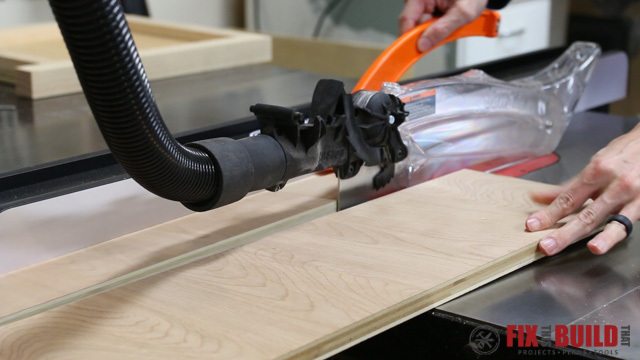 Using an over sized bit allows room for wood movement. 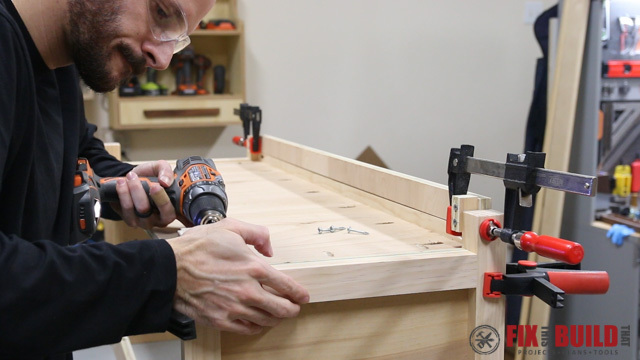 With all the pieces ready I started to assemble the entryway shoe storage bench. 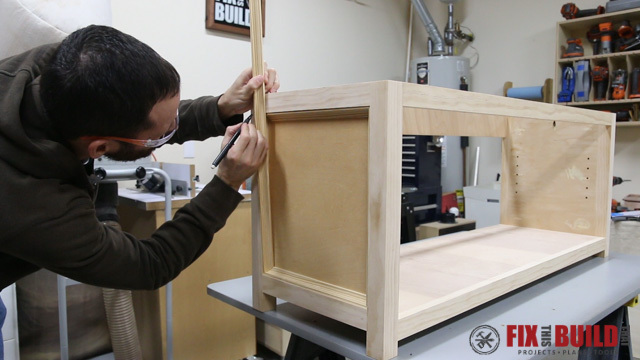 I attached the front and back stretchers with pocket screws, making sure to leave the rabbet in the back legs open. Then I flipped the base over to attach the lower shelf. 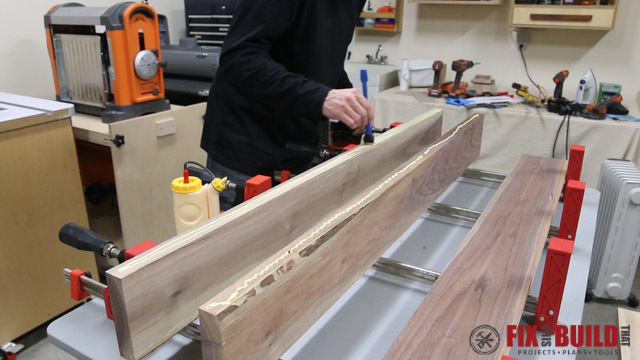 I used spring clamps to position the shelf trim 1″ from the bottom. 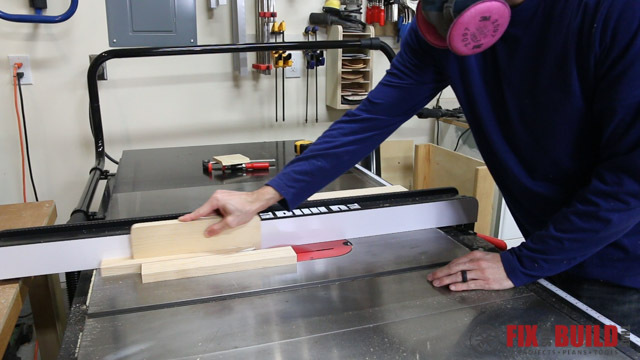 I also referenced the distance from the bottom of the shelf at 1-3/4″ to the bottom of the legs to get the bottom shelf even. 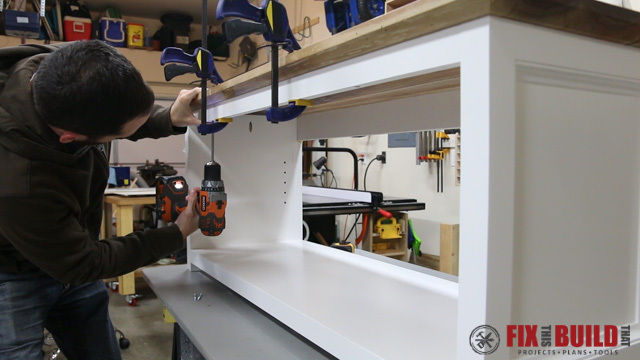 After that I attached the bottom shelf to the sides with 1-1/4″ pocket screws. 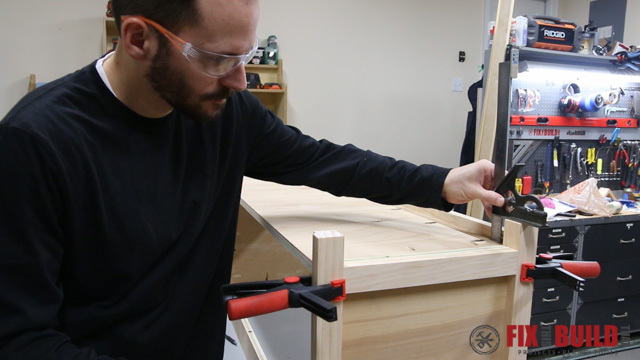 I made the adjustable shelf the same way I did the lower shelf, attaching 1×2 trim to the front. 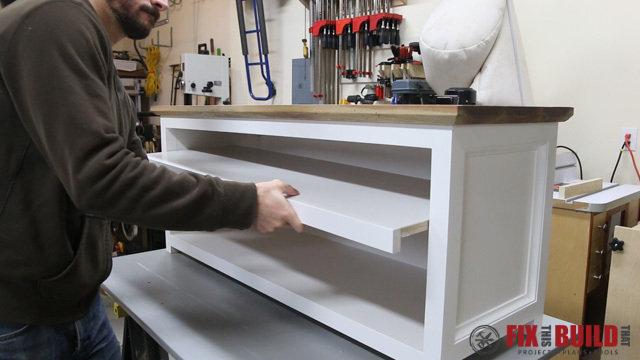 I waited until after the base was finished so I could get the size of the shelf just right and minimize the gap between the legs and the shelf. 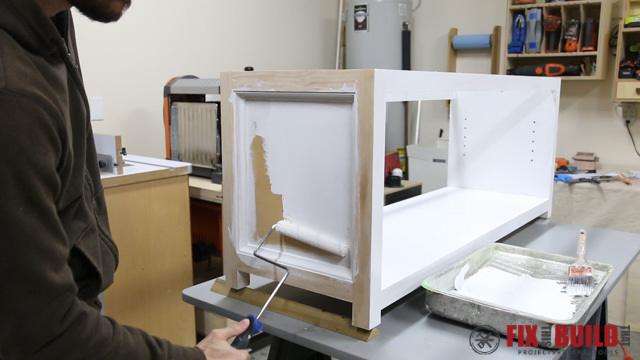 I added some detail around the side panels by cutting some 11/16″ cove molding to fit around the inside of the panels. 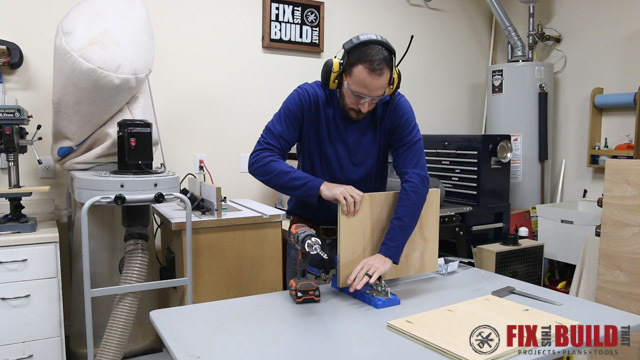 I measured and cut miters on each piece on the miter saw. Then I attached the pieces with a small pin nailer. 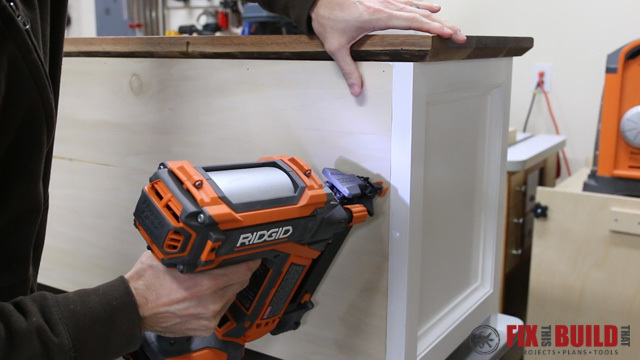 A brad nailer will work here as well. With all of the base parts assembled I sanded everything to 150 grit and started on my first coat of paint. I used a semi-gloss latex paint and ended up doing 3 coats. I used a foam roller cover since it gives a smooth finish. 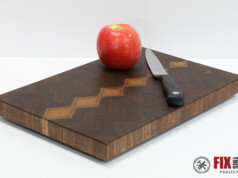 Next I moved on to my favorite part, the walnut top. 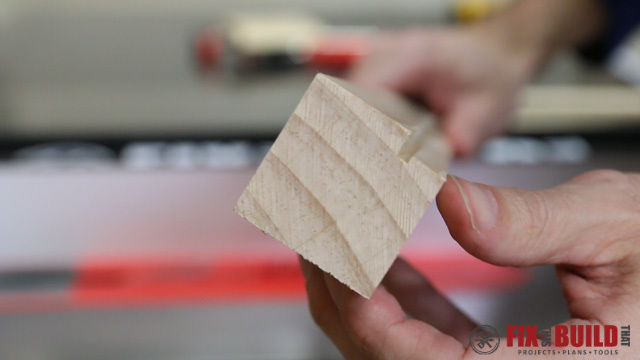 Since I milled my own wood it turned out to be about 1-1/8″ but you can substitute 1×6 or 2×6 boards for the top depending upon the look you want. 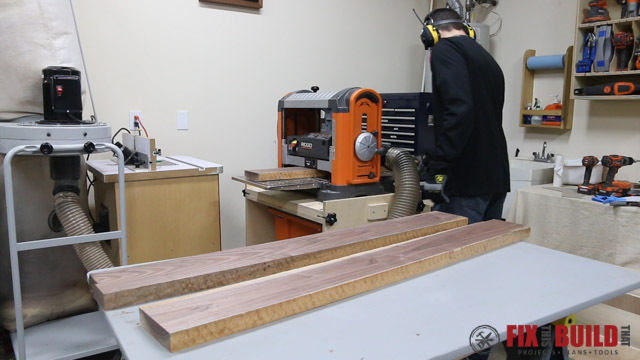 Next I took them to the tablesaw and ripped them each down to 5-½”. 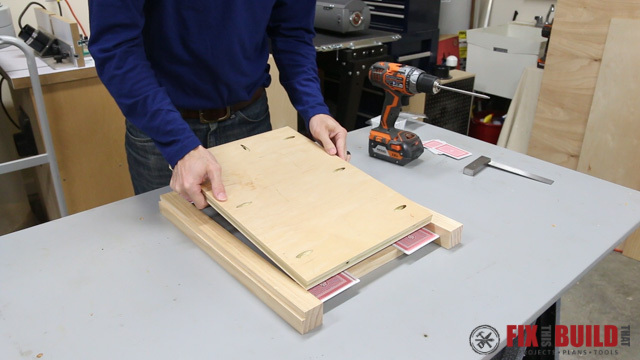 This will give me a 16-½” top for my DIY entryway shoe storage bench. 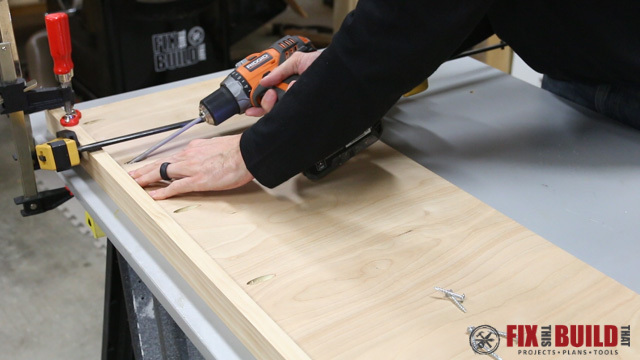 I used wood glue in my favorite glue bottle and a bevy of clamps to join the boards together. 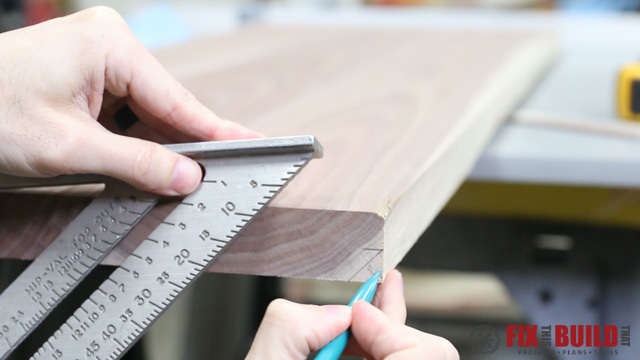 No biscuits, dominos, or other oddly named joinery methods are needed here since glue is plenty strong by itself on long grain joints. 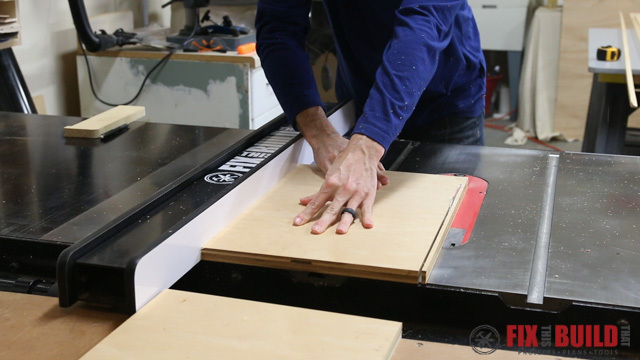 I just put a few small clamps on the glue joints at the ends of the boards to keep everything aligned. 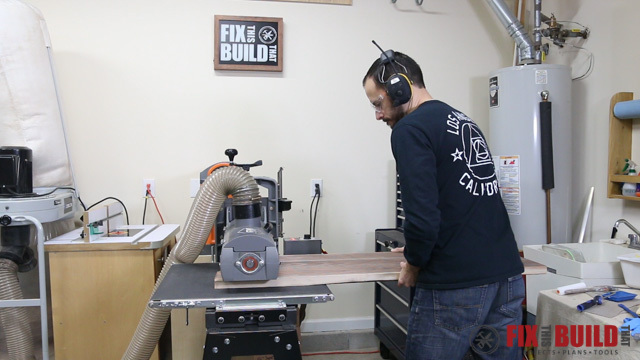 From here you could go straight to hand sanding but I’m lucky enough to have a drum sander. 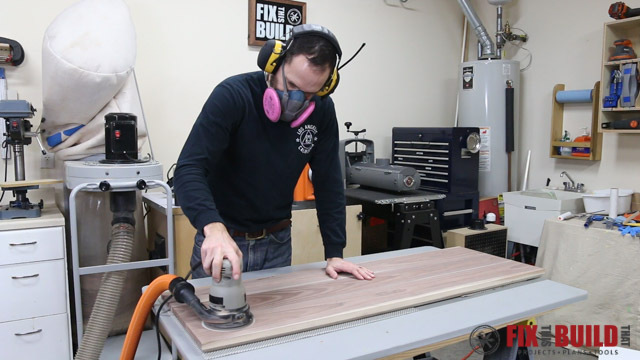 So I sent it through for final flattening and eliminated a lot of time on the orbital sander. 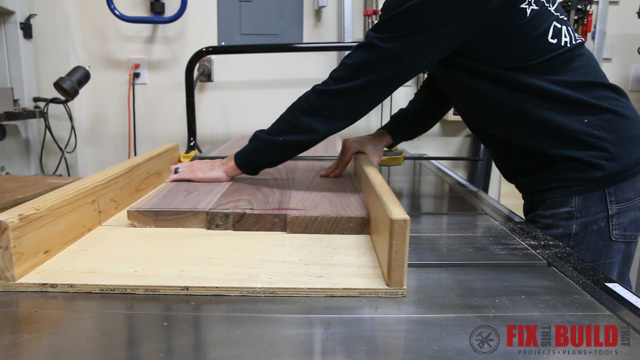 After getting the top smooth tabletop down to 47” long on the crosscut sled which is a nice size for two adults. I cut a bevel on the underside of the top to lighten the look and deal with the bark voids in one step. 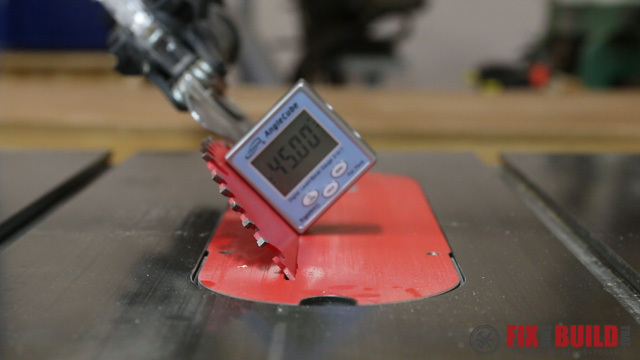 I set the saw blade to 45 degrees using my digital angle finder and cut the bevel on the front edge then I flipped it around and cut the bevels on the sides. 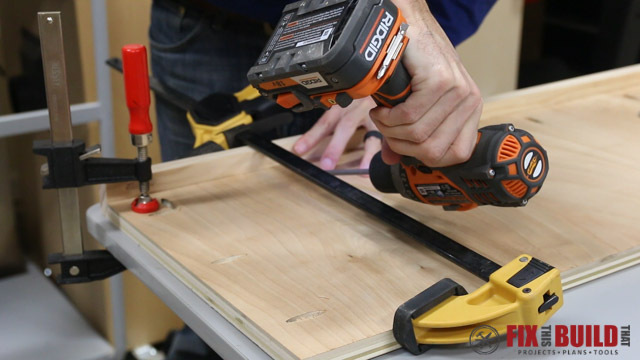 If you are going with a ¾” top then it will be far easier to use a chamfer bit in a router. Finally it was time for finish so I sanded the top up through 220 grit. For the top I used a polyurethane satin finish. 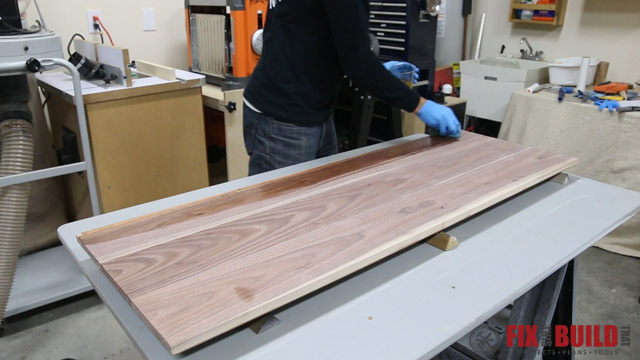 I applied two coats slightly thinned and two more thinned 50/50 with mineral spirits which makes for a nice finish. 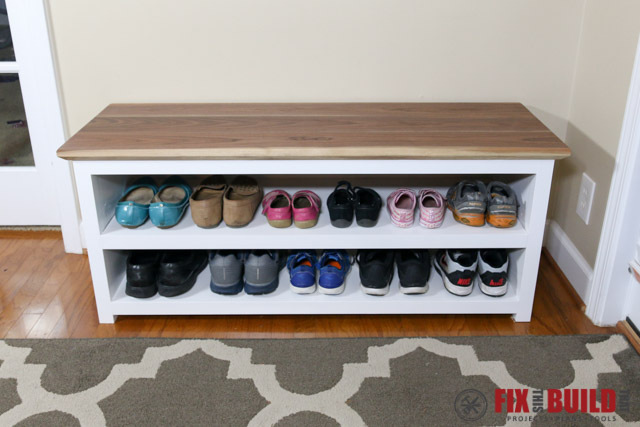 It was finally time for the DIY shoe storage bench to come together! 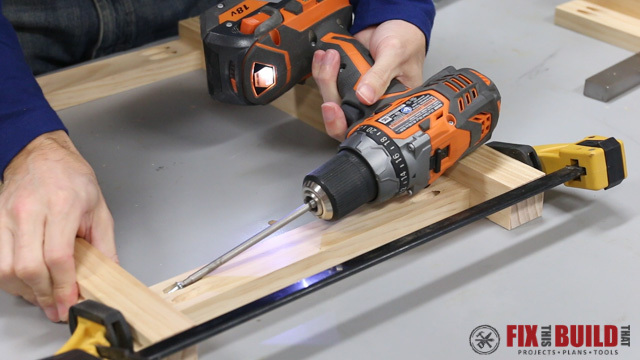 I positioned the top for a consistent reveal around the front and sides then secured it to the base with pocket screws through the oversized holes. 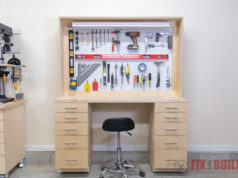 After that I flipped the bench around and nailed the back on with a brad nailer. The last thing I did was install the adjustable shelf. 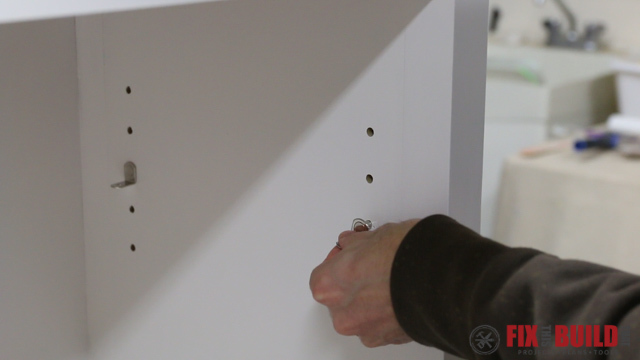 I used these shelf pins that have a hole to secure the shelf with screws since they will get a lot of action. 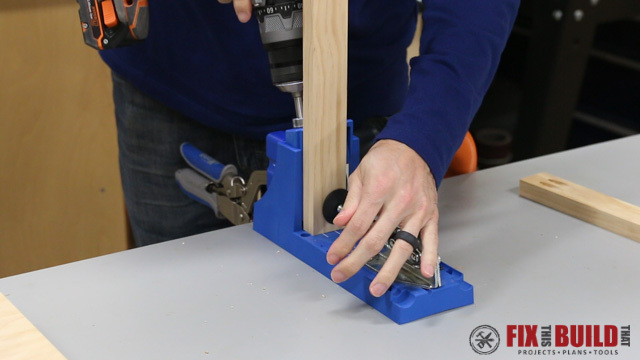 This will help keep the shelf in place when my kids are slinging shoes in and out of the bench. I moved the bench into the front hallway and we loaded it up with shoes. This is a way better solution than what we had before! 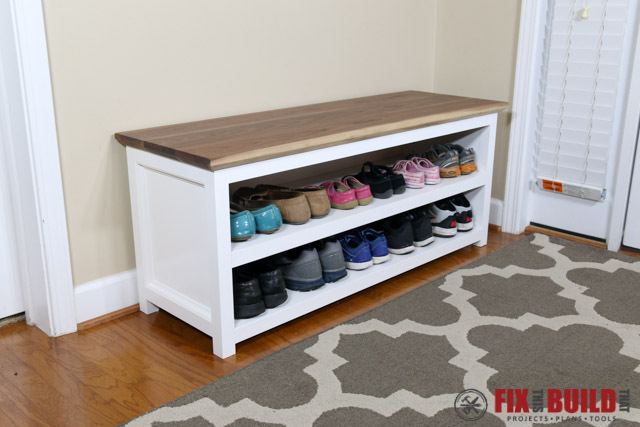 You can get detailed plans for this DIY entryway shoe storage bench below. 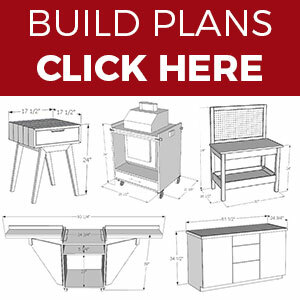 If you want to see other cool furniture projects for the home then head over to my Furniture Projects page.